Once you realize what a joke everything is, being the Comedian is the only thing that makes sense. We’ve been going through a rough patch and ask that our friends respect our privacy in this difficult time. 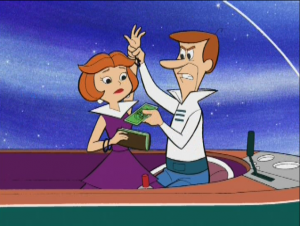 George Jetson, popular resident of Orbit City, and his wife Jane have announced that they intend to seek a trial separation. “It’s true” said Jane Jetson. George and I have been going through a difficult stretch in our marriage. He’s changed. He’s not the same man I married. That’s all I’m going to say about it. I ask everyone to please respect our privacy. Those close to the couple say that George had become concerned with their reliance on modern technology. “I remember him telling me that technology had taken away his soul” said a friend. “Look at me” he would say. “I work one hour a day, two days a week and I complain that that’s too much? Anything I want is literally at my touch. Computers monitor everything. They tell me when to wake up, what to eat, when to make love to my wife. The NSA monitors my place. Yes, I know the NSA does this for my protection and I’m fine with that but still!” Then he would tell me about these survivalist vacations he wanted to take in the wilderness. Roughing it like the pioneers he said. I almost went but when he said there was no cell phone signal I bailed out. That’s just too much to ask. His wife Jane fretted over George’s new preoccupations and tried to humor him. “I even took a sewing class for him” she said. I don’t know why. I can get new clothes anytime by pushing a button. But he’s my husband and I love him. I wanted our marriage to work. 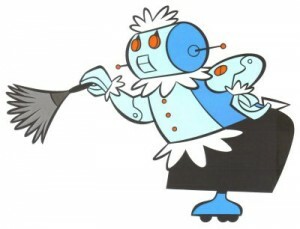 Jetson decided to make a complete break with technology when he realized he was more sexually attracted to his maid robot than his wife. “It’s true. Many men have this problem” said his boss Cosmo G. Spacely. I love you long time, Mr. Jetson. and have her satisfy his sexual fantasies. His poor wife, who I may say is quite the hottie, was left out in the cold. The Industrial Revolution and its consequences have been a disaster for the human race. They have greatly increased the life expectancy of those of us who live in advanced countries but they have destabilized society and have made life unfulfilling. We therefore advocate a revolution against the industrial system. In the meantime George’s wife, Jane, has moved in with his former boss Mr. Spacely. “Girl’s got to eat” she said. After Jane found Mr. Spacely unfulfilling, she ultimately married former Simpsons screenwriter DeWayne Knight; and the two began fighting crime as Mr. and Mrs. Batman, wearing identical lavender and purple batsuits with black underwear and gold utility belts. The two took over Bruce Wayne’s mission of fighting criminal masterminds such as The Joker, Riddler, Penguin, Catwoman and Mr. Freeze. Two of them got tommyguns. And they’re all talking some foreign language. They could be Russians or something! The Manhattan Infidel lives and works on the Island of Manhattan. In his spare time he enjoys curling up in a fetal position contemplating the wreck of a once promising career. Kars For Kids to Break Up! Porky Pig Arrested in Pre-Dawn Raid!